Automatic's connected dongle and mobile apps give your 'dumb' car some digital smarts. The device is easy to install and the mobile apps are intuitive, but we found a number of reasons to hit the brakes before you buy. If you frequently drive your personal automobile for business purposes, and if you often drive it out of town, Automatic's connected car device ($100) and free Android and iOS companion apps could prove to be valuable tools. Automatic is one of several new-ish gadgets that connect to a car's OBD-II data port, a standard in most vehicles built since 1996. As you drive, the device gathers data about your trips, including miles driven, gas used, and driving performance. When a trip is over, you can use the Automatic mobile app to view a map of where you drove; how many stops you made, and where; mileage costs; total time; and your car's average miles travelled per gallon of gas. You also receive an overall driving score, based on how often you hard-braked or hard-accelerated and how many minutes you drove at a speed of 70 mph or more. Automatic's website shows a Mini Cooper, so I figured I wouldn't have much trouble installing the device in my 2005 Mini. I was right. It took a total of 22 minutes to get up and running, and the majority of that time was dedicated to updating the device's firmware. It can be a pain to record each individual business trip, especially if you drive often for work reasons. Automatic makes the process easier by letting you tag completed trips as "business," so it's simpler to separate work and personal mileage. 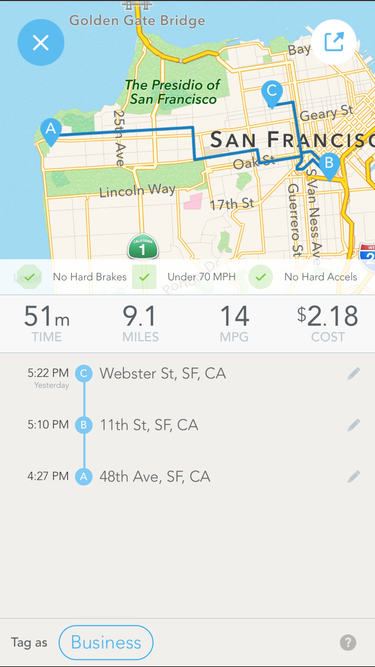 The Automatic app includes a map that shows you where your car is currently parked. This should be another welcome benefit if you often park in unfamiliar locations or — in my case — you cruise for parking spots while thinking about something else, and then forget where you left the car. Own a Nest thermostat? Via the magic of IFTTT recipes, you can automatically adjust your home's temperature whenever you drive your Automatic-equipped vehicle away from or to your home. (A total of 13 Automatic/Nest recipes are currently available.) In addition to IFTTT, Automatic connects with other services such as Expensify, Concur, and FreshBooks, all of which can help simplify expense reporting. Automatic also offers other features and potential benefits, such as the ability to flag engine trouble and then notify you. However, the four points mentioned above are my favorite things about the gadget. Unfortunately, I did find a few reasons not to buy an Automatic. If you drive an electric vehicle, you're out of luck; Automatic doesn't work with them. Some people just aren't comfortable with idea that they're driving locations are recorded and stored in the cloud. However, Automatic promises its user data is protected by 128-bit "bank-level" AES encryption. Automatic's app is intuitive and nicely designed. And the dongle device works as promised, at least during my week of tests. If you want to turn your older car into a "smart" car, it's a good, and relatively affordable, start.